Kelsea Ballerini brings her Miss Me More tour to the U.S. Cellular Center in Cedar Rapids on Friday, May 10th. 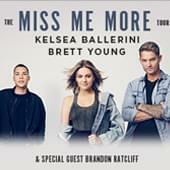 Joining Kelsea that Friday night is Brett Young and special guest Brandon Ratcliff. Tickets are on sale now. From Monday, April 8th until Friday, April 26th, 107.3 The Party has 3 chances every day to win tickets. For more information on the contest, click here!